I came to Chiang Rai expecting it to be nothing more than a place to rest in-between Chiang Mai and my next destination in Laos, but I’ve been pleasantly surprised. Chiang Rai is much more relaxed than Chiang Mai and Bangkok but there are still lots of activities and it makes a great place to chill out and enjoy the relaxed atmosphere. The best things to do in Chiang Mai aren’t in walking distance of the city centre so I’d definitely recommend hiring a bike or scooter for your stay. Chiang Rai’s most famous attraction is Wat Rong Khun (or commonly referred to as The White Temple). It’s an absolutely beautiful temple, but be prepared for every man and his dog trying to get that iconic shot outside the temple. It’s located 13km towards the south of the city, just off the main highway although you’d never realise this once you’re in the peaceful grounds of the temple. I love that temples in Thailand feel a bit more friendly and down to Earth than religious buildings in other parts of the world, keep an eye out for some familiar faces hidden in the decorations including Iron Man, Darth Vader and Gollum. Khun Korn waterfall is just a 25 minute drive from the White Temple and is definitely one of the best things to do in Chiang Rai. I’d recommend combining these two for a brilliant day. The waterfall is located up in the Kok River National Park and at 70m high it’s the largest waterfall in Chiang Rai province. Swap the hustle and bustle of the city and popular tourist attractions for the green peaceful surroundings of the jungle. Be prepared for a short hike from the car park up to the waterfall but you’ll be rewarded with a stunning sight of nature. Enjoy a drink in the company of some feline friends at Cat ‘n’ a Cup café located in Chiang Rai. The cats here are the most adorable you’ve ever seen. At first the cats seem a little reluctant to come near you but buy some cat food from the counter for 40baht and you’ll soon be the most popular person in there. Located just north of Chiang Rai is Baan Dam Museum, also known as the Black House. All of the pieces of work in this museum were created by controversial Thai artist Thawan Duchanee who spent over 50 years pulling it all together. This is a museum unlike any I’ve ever seen before, full of interestingly designed pieces of furniture, paintings, animal skins and sculptures spread across more than 40 buildings. I wouldn’t recommend making the journey specifically to see the black house but combined with the monkey temple and golden triangle it makes a nice day out. Get up close and personal with some monkey friends at Wat Tham Pla, more commonly known as the Monkey Temple. The temple is set against the beautiful backdrop of surrounding cliffs with tons of monkeys allowed to roam free. The baby monkeys were incredibly cute and it was great to watch them playing and rolling around together (although their parents were never too far away!). I wouldn’t recommend feeding the monkeys, we saw a family attempt this which was quickly followed by the monkeys attacking them to try and take all of the food for themselves. The point where Laos, Myanmar and Thailand meet is known as the golden triangle. Separated by the Ruak and Mekong rivers, this was once the centre of the opium trade in the area and you can visit the nearby opium museum to learn more about this. Whilst you won’t be able to cross into Laos or Myanmar, on the Thai side of the border is a large golden Buddha statue and a small market with a viewpoint across the rivers. For me, the most wonderful part of visiting the golden triangle was the beautiful drive to get there. I’d recommend driving there yourself rather than taking an organised tour. Up there with the White Temple and the Black House, the Blue Temple is a must visit attraction in Chiang Rai. Officially known as Wat Rong Suea Ten, the Blue Temple is relatively new, having only opened in 2016. I really enjoyed looking around this temple, it is an incredible piece of architecture and entrance is free which is always a positive. Everything has been designed in blue and gold except for the large white Buddha statue inside the temple which makes a great contrast. Although it is only a few years old, it is built upon the remains of an ancient temple which was abandoned about 100 years ago. There are many trips to visit hill tribe people from Chiang Rai with the most popular being the long neck karen tribe. I’ve heard many bad things about the way hill tribe people are treated as a tourist attraction and think it’s very sad how the karen tribe make young girls stretch their necks so I decided not to go on a tour during my stay in Chiang Rai but will keep an eye out for an ethical way to meet these people. Instead, I took a visit to the Hill Tribe Museum in Chiang Rai. Although quite small, it’s a great way to learn about the different tribes in Thailand and to get a bit of insight in to how they live. No list of ‘best things to do in Chiang Rai’ would be complete without somewhere to indulge in local food. I visited the food stalls at the night market every single evening during my stay in Chiang Rai, it’s epic. There’s a large seating area surrounded by food stalls selling all sorts of Thai food. Pad Thai, Fried rice, Spring rolls, Thai Hot Pot, Green curry, Smoothies, it has everything you could want. There was also fee entertainment until late each evening including traditional Thai dancing, acoustic singing and bands. From a distance I could see the large white statue overlooking Chiang Rai at Wat Huay Pla, but as we neared I realised that it was not Buddha but Guan Yin, the Goddess of Mercy. 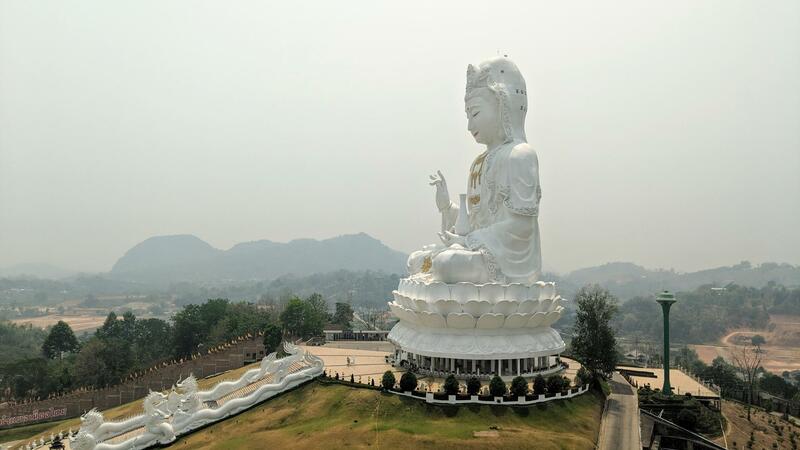 As well as the large statue, there is a beautiful white temple and a 9 story padoga which houses more wooden Guan Yin statues. For 40baht you can take a lift to the top of the large Guan Yin statue, but instead we chose to climb to the top of the Padoga which is free of charge and gives you a fascinating view across the Thai landscape. Chiang Rai is generally quite a quiet and chilled place so there isn’t much nightlife. If you’re looking to hit some bars, seek out Jetyod road. Luckily for us this was right near our hostel so a few beers were never far away. When you really want to party, head to Par Club. Expect a mixed line up of DJ’s and live performances from bands. When we visited, we were the only tourists in the club which was a great experience. The Thai people were really friendly and it wasn’t long before we were sharing drinks and dancing with some locals. You’ll become familiar with the infamous Chiang Rai Clock Tower during your stay here as it is a useful landmark to refer to as you navigate the city. The golden clock tower was designed by the same architect as the White Temple and is an astonishing piece of work. Although I was a bit disappointed that it had been built in the middle of a busy roundabout which detracted its beauty a little. At night the clock tower is lit up and if you’re nearby at 7pm, 8pm or 9pm, you’ll witness the “light show”. Don’t raise your hopes too high as the lights on the clock just change colour to music for about 10 minutes, but it’s still a great excuse to take a moment, have a beer and enjoy Chiang Rai.